As soon as my dad had made his way to Vancouver we started the hard work of getting back on track, and it didn't take long for the results to show. After just a few months back together (but many hours on the courts) we were, once again, feeling positive and upbeat about where my game was going. We started traveling to play tournaments in Washington and Oregon again, and my results were starting to re-established themselves. I soon became the best 16 & Under player in the USTA section of the Pacific Northwest (PNW), and in the summer 2005, a few months after turning 15, I made the finals of an 18 & Under ITF junior event. Midway through the following year, I achieved the #1 ranking in the U18 category in the PNW. Also in 2005, we began making summer trips to the Czech Republic and trained at the Czech National Training Centre in the city of Prostejov. The tennis centre in Czech (TK Prostejov) took us in with open arms. They were amazingly open and kind to us and, even as a Canadian (although with a Czech heritage), offered me the facilities free of charge. I received free coaching, free massages, free food, free fitness training, and free physio treatment. There were many professional players that were training at the club (Berdych, Stepanek, Tabara, Hajek, J. Pospisil, Lojda) and we were thrilled to have been placed in an environment that we had never been in before. This was the beginning of a special connection that I grew with the training centre and that I still carry strongly today. After all these years, TK Prostejov, and everyone there, has a special and personal significance to me and my maturation. Regarding the developmental stages of my career, making this connection was probably the best move (if I had to choose one) that my father ever made. During the time we spent there (2 to 4 months every summer from ages 15 to 19), we played practice matches with the juniors (who were the best in the country), received some tips and lessons from the local coaches, and made TK Prostejov our training base for the summers. I honestly cannot say enough good things about everyone there and the way I was treated during those years. What I perhaps appreciated most was that they stood by me and supported me regardless of my results, and that's something that is hard to find in the tennis world. In the winters we started making our way down to Florida. There were many tournaments to play and ideal training conditions. My father purchased a used Winnebago in Vancouver and we used it to make our cross-continent travels from tournament to tournament. Every winter, from 2004 to the winter of 2006, my parents and I took the Winnebago and drove it from Vancouver to Florida on a nearly 5 day journey (with minimal stops). We slept at "Rest Areas" along the way and when we finally reached sunny Florida, we went right into training. Two of those years we stayed at a family friends' home in Boca Raton (Miami Area) and trained on their community courts. Another year we stayed in Bradenton (south of Tampa), rented a house for a month or so, and trained with a Czech player (from Prostejov) who stayed with us during that time. Although these trips were mainly meant for training purposes (with many players to play with and courts to play on), we also played the prestigious junior events in the area (Orange Bowl, Eddie Herr), but never quite having any significant singles results. 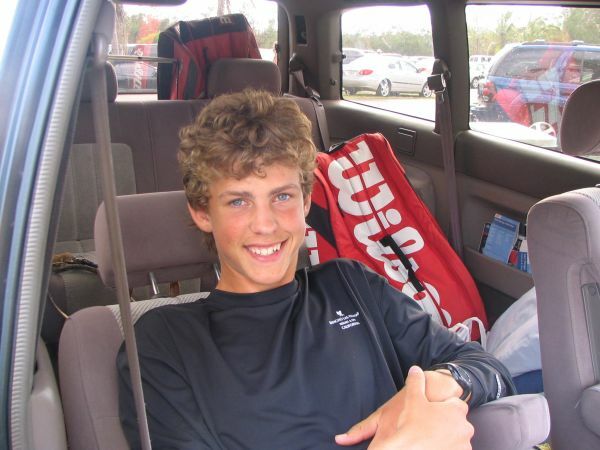 In March 2007, still 16, I received WC's into a string of 3 Futures (low level pro events) in Canada and made my first ATP point after winning my first round over a Guatemalan ranked around 600 on the ATP Rankings. At the third event, I won the doubles title with a fellow Canadian, Erik Chvojka. To my great pride, although the older and more experienced Chvojka carried me throughout, I supposedly became the youngest Canadian to win a professional title. These were pretty much the only pro tournaments that I played throughout the year as the main focus was still on the Junior Rankings. It was around this time that Tennis Canada hired a new Head of Development, Louis Borfiga (who had a similar position in France), and made some major changes in this department. Under Borfiga, I was suddenly offered to move to Montreal and join the newly established National Training Centre. The achievements of Tennis Canada are deservingly very public now, but at the time, their national training centre was new and entirely foreign to us. Also, with the experience of the previous coaching change still relatively fresh, my father was hesitant to put me in the hands of another coach and out of his sight. After declining the option of the NTC, Tennis Canada provided us with some crucial financial support, which, along with sponsorship from family friend, Sam Boguslavsky (Sable Developments), made our Junior travels possible. My dad bought a used 1991 Honda civic in the Czech Republic which we drove around Europe playing Junior ITF tournaments. Being based in Czech in the summer, living at my Grandma's house in a small village, was the least expensive way to play Junior tournaments and try to build a world junior ranking. We started by playing lower level ITF Junior events and it was really not easy to climb up the rankings. Especially in Europe, on clay courts, the competition was very stiff and I struggled to win many matches in singles. My doubles results, however, were exceptional right from the beginning and, thanks the junior ranking system which counted 1/4 of the doubles points towards your overall ranking, I slowly made my way up to be ranked high enough to play the bigger tournaments and Grand Slams. In the Summer of 2007, at 17, I played the US Open (my first Grand Slam) where I made the finals of doubles and 2nd round of singles. I would then win several doubles titles (including the Orange Bowl) and made the doubles finals of the Australian Open in 2008. My singles results, although occasional showing signs of promise, remained sporadic and inconsistent and usually ended in first or second round losses. I finished my Junior Career with my Highest rankings being 24 overall and 2 in doubles. In my last Junior tournament (Wimbledon 2008) and still 17 at the time, I lost in the first round to a top Junior. I played a high level match and held two match points on his serve at one stage. Before this tournament, since my singles results were not quite up to par and most of my ranking points being from doubles, the thought of going to college in the States was creeping into our minds. This, obviously, was never a part of our original plan. It was simply to turn professional; or to go pro for a few years and, if it didn't work out or if things weren't looking good, to go to school afterwards. But now we were hesitating and thinking that the option of going to College on a scholarship, and then pursuing my tennis career upon graduating, was not a bad one. However, after this match at Wimbledon, my father and I got approached by an agency called SFX (now Lagardere Unlimited). They were impressed with the match I played and wanted to sign a three year deal (making them my representatives), which would mean I would turn pro from the moment I signed the contract. My father and I were both quite flabbergasted by this approach and with a quick discussion that night, we signed our way into professional tennis.